Blue Origin achieved another milestone on Friday, successfully flying – and landing – the New Shepard rocket in a reuse test. The rocket had previously flown – and landed – back in November. The launch, land and repeat success is part of Blue Origin’s reusability foundation for its suborbital space tourism goals in tandem with the development of an orbital vehicle. 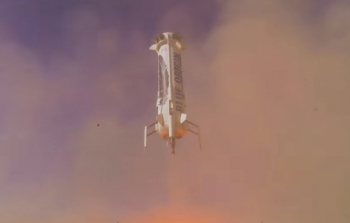 New Shepard conducted its first test flight last April, enjoying a successful launch, but failed to conduct a landing of the booster. However, the second flight was a success, launching to 330,000 feet prior to landing without an issue, allowing for this latest milestone of a reuse test. 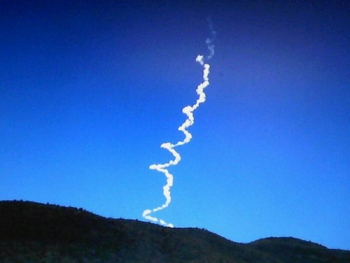 Local observers noticed a plume over the West Texas launch site on Friday morning, but as per usual, Blue Origin delayed news of the test for most of the day while a highly produced video was created. “The very same booster that flew above the Karman line and then landed vertically at its launch site last November has now flown and landed again, demonstrating reuse,” noted Mr. Bezos in a release late on Friday, accompanying the video. The turnaround of the booster for the test was relatively easy, according to the company, with the team only having to replace the crew capsule parachutes, the pyro igniters, conduct functional and avionics checkouts, and made several software improvements ahead of Friday’s flight. One of the software improvements related to the landing approach. “Rather than the vehicle translating to land at the exact center of the pad, it now initially targets the center, but then sets down at a position of convenience on the pad, prioritizing vehicle attitude ahead of precise lateral positioning,” added Mr. Bezos. “It’s like a pilot lining up a plane with the centerline of the runway. If the plane is a few feet off center as you get close, you don’t swerve at the last minute to ensure hitting the exact mid-point. You just land a few feet left or right of the centerline. Mr. Bezos went on to explain that the New Shepard test flights are showing the company has a good understanding on the challenges associated with vertical returns of the booster for a pinpoint landing. “When you do a vertical landing, you’re solving the classic inverted pendulum problem, and the inverted pendulum problem gets a bit easier as the pendulum gets a bit bigger. Try balancing a pencil on the tip of your finger. Now try it with a broomstick,” he continued. The aspiration of rocket reusability is being led by SpaceX, with Elon Musk hugely responsible for driving the industry forward for years. Numerous companies are now attempting to install reuse into their plans, although SpaceX now has a major achievement in the bag with the safe return of the Falcon 9 first stage during the successful OG2 mission in December. That historic first received an almost sarcastic response from Mr. Bezos, welcoming SpaceX “to the club” – based on Blue Origin’s previous return of their booster during New Shepard’s second flight. However, the internet community – via a series of humorous videos and photos (one on the left via a NSF member) – were quick to note the difference between Blue Origin’s suborbital success and SpaceX’s much more difficult return of an orbital rocket. Mr. Musk was also quick to note the difference in a series of tweets. 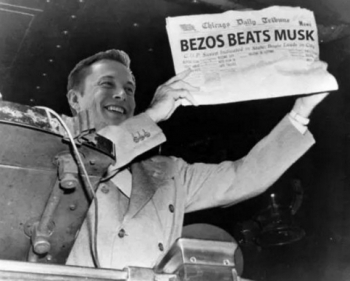 However, Mr. Bezos did opt to congratulate SpaceX after its recent Jason-3 mission that almost resulted in the first successful ASDS landing for the Falcon 9 first stage. “Impressive launch,” tweeted Mr. Bezos. 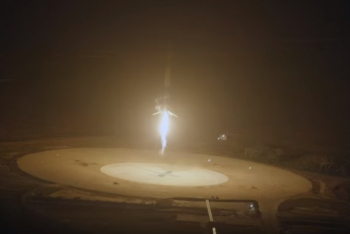 “SpaceX will soon make Falcon 9 landings routine – so good for space! Kudos SpaceX!” The comment received thanks from Mr. Musk. Blue Origin is aiming to join SpaceX in the orbital market, with a rocket powered by its 550,000-lbf thrust liquefied natural gas, liquid oxygen BE-4 engine. That engine is expected to start a test program this year. That rocket was shown during the announcement that an agreement to take over the historic Launch Complex 36 (LC-36) at Cape Canaveral had been signed. Blue Origin will be creating over 300 jobs at its East Coast home base for production and launches. 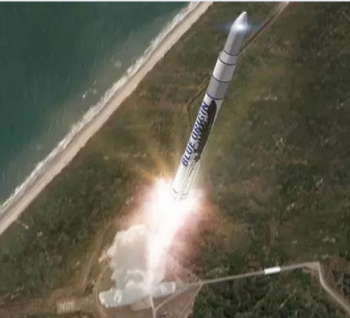 More details on this larger rocket are expected later this year, according to Mr. Bezos. “We’re already more than three years into development of our first orbital vehicle. Though it will be the small vehicle in our orbital family, it’s still many times larger than New Shepard. (Images via Blue Origin and SpaceX).